After a couple of episodes that had the fandom excited about the way season 11 has gone back to the good old days of early seasons I was excited to see what the latest installment from veteran writer Robert Berens brought us. If I’m completely honest, I was left feeling a little flat. The mythology of this intriguing season moved along nicely and there were some great reveals and appearances from interesting characters, but overall the episode felt rushed and convoluted. Berens had mentioned that he had written so much into the installment that much needed to be edited out and I did feel that. While sticking around Falls River to figure out where Amara may have struck next, Sam persuades Dean to utilize the one advantage they have, the angel power of Castiel who is currently still sequestered in the bunker binge-watching old seasons of Jenny Jones. Promising to do what he can to find Metatron, someone who may once have been close enough to God to have heard something about who or what Amara is, he pulls on his trademark trench coat. As he attempts to leave we see his reaction to the prospect of going outside, the fear he experiences as he flashes back to when he’d hurt Dean and had been told he was a monster. Use of a go-pro camera gave us a very visceral close-up and helped us experience the terror of agoraphobia along with the character. Misha Collins played the fear very well, his reluctance to even touching the door handle being an accurate representation of how hard it is to even consider stepping out of a comfort zone when suffering from this debilitating condition. Unfortunately I felt there was a lack of follow-through on this as, once Cas has spotted Metatron on a news report, he immediately goes out to find him. Maybe one of the edited scenes had shown him overcoming that initial reluctance and battling through for the greater good, but as a viewer I felt cheated out of experiencing that with the character and his sudden willingness to venture outside took me out of the story. 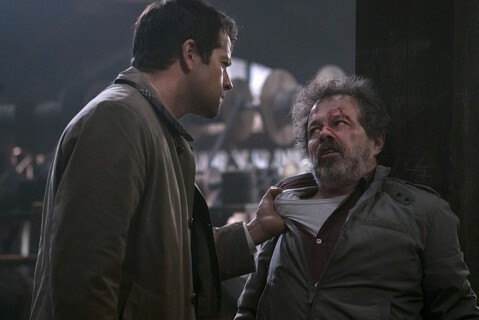 Regardless of my confusion over Castiel’s bravery, the scene between him and Metatron, an ever-amazing Curtis Armstrong, was powerful, violent and a fascinating narrative on what literature has devolved into in the modern world. Citing reality as the great literature of our time, Metatron pleads his case for keeping his income source, selling breaking news videos to local TV stations. As Cas beats him to a bloody pulp he finally admits how miserable he has been and pleads with the angel to end his pain. Once again I was confused about the sudden turnaround in Castiel’s behavior. His evolution from a trembling wreck to an aggressive enforcer in such a short time was hard to swallow, as was the throwaway comment that the TV station had given him Metatron’s address so he could take the demon tablet. Oh, did I mention? Yes, they’ve found the demon tablet, with no fanfare and no elaboration. I’m sure there will be more to it in upcoming episodes but it was just one more question I had about what this episode offered. There was one huge reveal that took me aback. Castiel asks Metatron about The Darkness and finally gets the scribe to admit he knows who she is. When God created Earth, he was made to sacrifice and, being his only kin, his sister was banished to The Darkness. I would never have anticipated Amara being God’s sister, it’s a fantastic reveal. Her confusion about God’s actions, her willingness to commit heinous acts but her bewilderment at the suffering God appears to have inflicted on the world fits in very nicely with Supernatural’s ongoing representation of God being contradictory and disinterested. It seems that the siblings between them could achieve some kind of balance. Maybe this will be where God finally shows himself to the Winchesters. Or is that just me hoping for a reappearance of Rob Benedict’s Chuck? Meanwhile, Sam and Dean receive a phone call telling them that Len, the hapless Lizzie Borden obsessor who confessed to murders he didn’t commit to protect the world from his soulless self, has been killed while in police custody. While at the station the boys recognize soulless symptoms in a teen who attempted to kill her mother. Using her as bait, they trap a demon who admits that it is Crowley who is sending him to clean up the consequences of Amara’s sneaking out and leaving soulless vessels. He refuses to talk anymore and Sam suggests exorcising him rather than using Ruby’s knife, attempting to save the vessel. Dean is frustrated by the interruption but reluctantly agrees to abide by Sam’s new mission of saving the people they encounter. However, the vessel is beyond repair, sporting a gaping bullet wound over his heart, so Dean kills the demon with just a hint of the pleasure we saw in Demon Dean. Between the location of the attacks and their knowledge of Crowley’s love of all things grand they single out an abandoned hospital as a suspected base for the King of Hell. 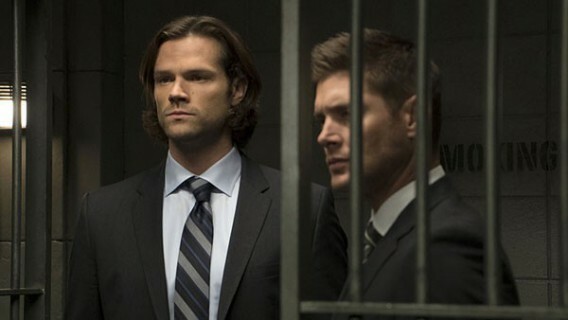 They make their way inside the rundown building, Sam cautioning Dean that they do not know what security is inside and Dean seeming to take that as some kind of a challenge. When they pinpoint the location of Amara, Sam sends Dean in to kill her while he promises to hold off the demons heading their way. Why won’t they learn, splitting up is never the answer! Without knowing the Winchesters are hot on his trail, Crowley struggles to deal with what is now an unruly, stubborn teenager. Trying to curb her appetite is becoming a struggle for him and he is forced to show his strength to attempt to control her. The use of his brutal power showed that this is an evil being and I, for one, was thankful of the reminder. 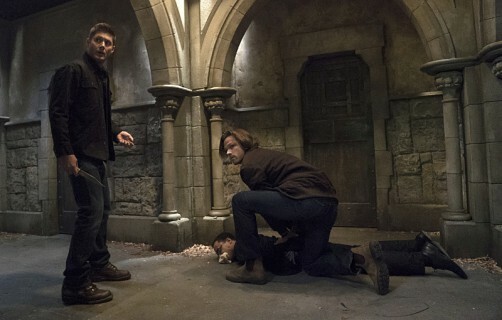 As Dean bursts into the chamber he is slammed against the wall and Crowley promises him that their “bromance” is over, he will kill him this time. Amara decides this is not acceptable and uses her own power to immobilize her surrogate father. In a slightly uncomfortable scene where the teenage version of the ancient being appears to flirt with Dean she admits she has no idea what their link is but that she feels compelled to protect Dean. For his part he tries to raise the knife to her chest but fails and his confusion mirrors the viewer’s. Just what is it that binds these two? What traces of the Mark of Cain still have power over Dean? Sam’s battle with the demons shows off his fighting skills, deftly incapacitating two of them by beating them unconscious and cuffing them. As he tries to do the same with the third he is overpowered and has to resort to using an angel blade. His nonchalant shrug and statement that “two out of three ain’t bad” tells us that while Sam has desires to limit the killing he will still do what needs to be done to finish the job. It was also nice to have a little reminder of how adept Sam is at fighting, something that has often been overlooked in recent seasons. As Sam tries to barge his way in to rescue his brother he is once more overcome by visions of what is obviously his time in hell. When he finally bursts through the door it is only to be thrown back by Amara and as she exits, Dean slumps against the wall, managing to cling to consciousness long enough to ensure his brother’s safety, the question of his link to God’s sister still unanswered. Back at the bunker Dean lays into Cas for just letting Metatron go, something I must admit to being a little perturbed by. They discuss Amara’s origins and Dean bluntly asks Sam if he could request a vision from God, his assumption being that he has been sending the messages. Sam’s subdued response made me yell “TELL YOUR BROTHER!” at my screen! I really do feel like bashing their heads together sometimes. As Sam turns a corner and falls to his knees, we are shown his vision; The Cage, suspended by chains in hell in the same manner as we saw Dean at the end of season 3. Pasty, trembling fingers push through the bars and we are given a sense of desperation from whoever is communicating with Sam. While I had figured out a while ago that this was where the messages were coming from it was fantastic to see The Cage as a tangible object, the VFX giving the whole scene a sense of horror. As I stated at the beginning, I found the episode to be disjointed. In some ways the story-lines they were trying to address could have been conveyed in just two or three scenes. But it also appeared to be missing pieces. While I’m not always a fan of lengthy exposition sometimes it is a useful tool and I felt they could have inserted some quieter scenes between the action, even drawing the three distinct stories across two episodes. I cannot, however, fault either the direction of John Showalter or the performance by all main actors as well as the young actress who plays Amara. The final music cue, played over a montage of all our main protagonists, was perfect, a haunting “Girl, You’ll Be A Woman Soon” by Urge Overkill reminding us that teen Amara is still developing, leaving us wondering how much her powers will grow. I seem to be in the minority with my concerns about this episode but despite them, I still feel season 11 is fast becoming one of my favorites. What about you all? Did you enjoy it? Do you think it’s Michael or Lucifer talking to Sam? As always, comments are welcomed!